The procedure to place an implant takes 60 minutes for one implant and only 2 to 3 hours for multiple implants. The number of appointments and time required vary from patient to patient. Dr. Goettisheim will bring great precision and attention to the details of your case. Prior to surgery, you may receive antibiotics and for greater comfort, nitrous oxide (laughing gas), oral sedation, or general anestheisa are offered. These options are discussed with you at your consultation appointment. A local anesthetic will be administered to numb the area where the implant will be placed. When you are comfortable, the surgeon makes a small incision in the gum tissue to reveal the bone, and gently inserts the titanium implant. 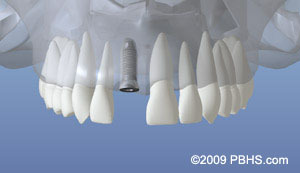 The top of this implant is often visible through the gum. Sometimes it is better in the early stages of healing to have the implant covered by the gum tissue. Now the healing begins. The length of time varies from person to person, depending upon the quality and quantity of bone. In some cases, implants may be restored immediately after they are placed. The surgeon will advise you on follow-up care and timing. After the initial phase of healing, the surgeon places an abutment (support post) or a healing cap onto the implant during a brief follow-up visit. This allows gum tissue to mature and provides access to the implant. Occasionally, impressions are made at the time the implant is placed. 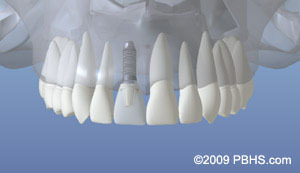 This enables the crown to be ready when the implants have healed. How long your mouth needs to heal is determined by a variety of factors. Follow-up care is usually needed to ensure that your mouth is healing well and to determine when you are ready for the restorative phase of your treatment. Sometimes it is necessary to perform a soft tissue graft to obtain stronger, more easily cleaned and natural appearing gum tissue in the area around the implant. This process involves moving a small amount of gum tissue from one part of your mouth to the area around the implant. Most often, it is a brief and relatively comfortable procedure. Whether it’s one tooth or all of your teeth that are being replaced, your dentist will complete the restoration by fitting the replacement tooth (teeth) to the dental implant (s). Implants are often placed several months after extraction. At times, an implant may be placed immediately after extraction of a tooth. This may involve a little more risk, but it simplifies the process—you won’t have to wait for another appointment to place the implant. When infection or other problems with the bone are present, immediate implant placement is not the best treatment. If your tooth has been missing for some time, the adjacent supporting bone is likely to grow thinner and shrink. This occurs because the root of the natural tooth has to be present to stimulate the bone. About one third of your jaw’s thickness can be lost in the year following tooth extraction. If you are missing enough bone, you may benefit from having additional bone grafted into the area. This ensures the implant will be adequately supported when it is placed in the jaw.